The asteroid community recently gathered in Helsinki, Finland for the 12th Asteroids, Comets, and Meteors Conference. As this meeting showed, one of the hottest topics in asteroid science is the study of asteroid families. The majority of asteroids orbit the Sun between Mars and Jupiter. As a century of research has shown, they are not randomly distributed in this vast region of space. The main asteroid belt has been sculpted by the dynamical evolution of the Solar System and the gravitational influence of Jupiter and Saturn. In addition, many asteroids are on very similar orbits and are classified into ‘families’. An asteroid family is a population of asteroids that share similar proper orbital elements. They were first recognized by Kiyotsugu Hirayama in 1918 and are often called Hirayama families in his honor. This plot shows the location of the main belt with respect to the planets and the Sun as well as the orbital structure of asteroid inclinations and number density of objects (yellow represents the highest number density, blue the lowest). Figure from DeMeo and Carry (2014). Many asteroids share similar orbits, which led scientists to realize that a common process is responsible for these groupings. The orbit of any object is defined by a handful of key properties called the orbital elements; these include perihelion (how close the orbit gets to the Sun), semimajor axis (the length of the longest diameter of the orbital ellipse), orbital inclination (tilt with respect to Earth’s orbit), and eccentricity (a measure of how circular an orbit is). When the orbital elements of main belt asteroids are plotted (typically inclination vs. eccentricity, or vs. semi-major axis), a number of distinct concentrations are seen against the uniform background distribution of asteroids. These concentrations are asteroid families. 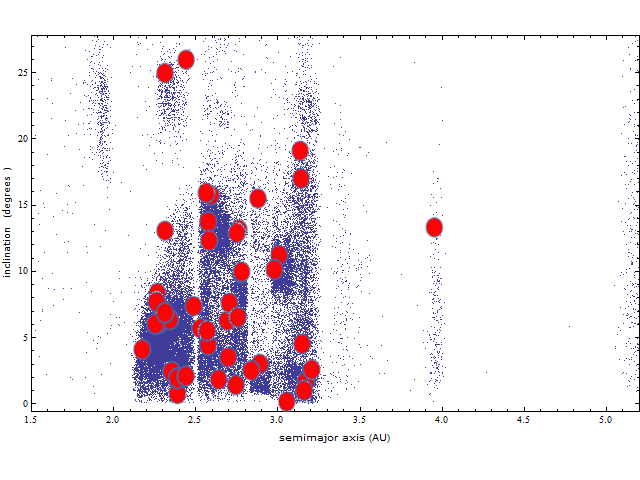 Plot of proper inclination vs. semi-major axis for numbered asteroids. Asteroid families are visible as distinct clumps. Prominent Kirkwood gaps divide the core region. (A, B+C, D, E+F+G). Figure from Wikipedia. Asteroid families are named after the largest member of the group to be discovered. Large families contain several hundred asteroids (and many more smaller objects which are yet-to-be discovered). Small families and groups can have as few as ten identified members. About 33% to 35% of asteroids in the main belt are family members. There are almost 40 reliably recognized families, with several tens of less certain groupings. 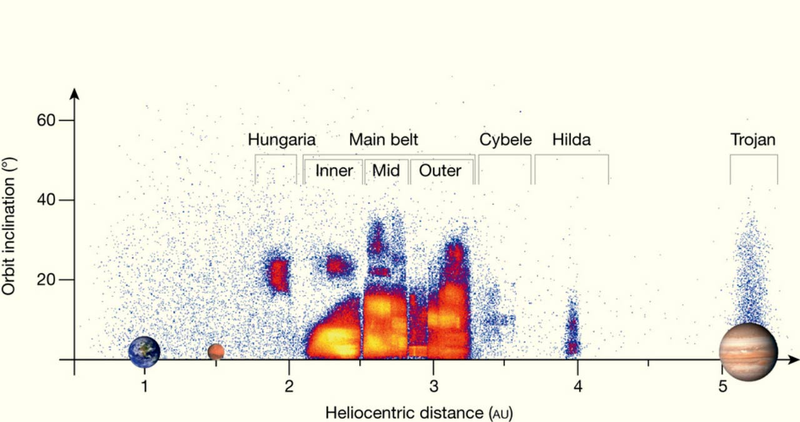 Most asteroid families are found in the main asteroid belt, although several family-like groups such as the Pallas family, Hungaria family, and the Phocaea family lie at smaller semi-major axis or larger inclinations than the main belt. Many asteroid families result from the catastrophic break-up of a large asteroid. Some time in the past, a bigger asteroid suffered an impact from another asteroid, breaking off smaller rocks that went off on their own orbits. After the collision, the fragments have similar orbits, with the differences dependent on the distribution of energy during the collision. Other asteroid families form in collisions that leave giant craters. For example, the asteroid Vesta’s southern hemisphere was excavated by two large impacts. The cast-off pieces move together in packs, traveling on the same path around the sun, but over time the pieces become more and more spread out. The impacts on Vesta created the Vestian family of asteroids. These asteroids are thought to be the source of the HED meteorites. 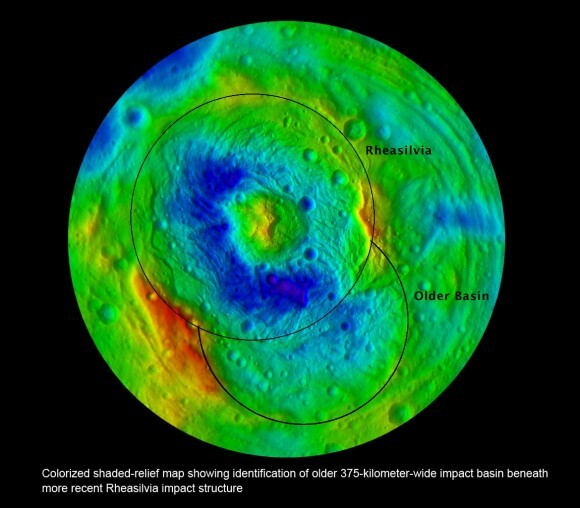 Southern Hemisphere of Vesta; Rheasilvia and Older Basin Colorized shaded-relief map showing identification of older 375-kilometer-wide impact basin beneath and overlapping with the more recent Rheasilvia impact structure at asteroid Vesta’s South Pole. 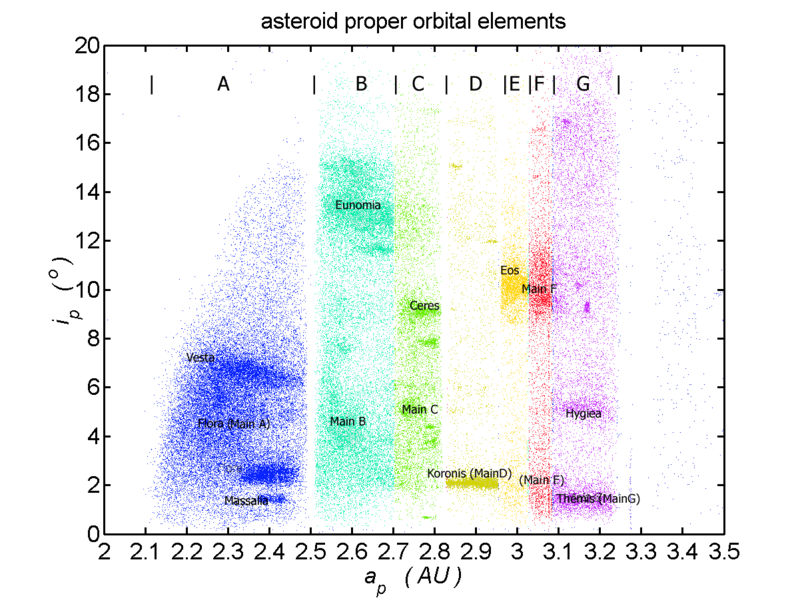 Asteroids in the same family generally have similar compositions and albedos. Some families consist of dark asteroids, while others are made up of brighter material. In some cases, multiple asteroid families overlap in orbital-element space. In order to identify one family from another, we rely on this similarity in brightness and surface composition to discriminate between them. Alex Parker, an astronomer at UC–Berkeley, took the asteroids in the solar system observed by the Sloan Digital Sky Survey—more than 100,000 objects—and created an animation showing their orbits, their relative sizes, and their colors in the survey. By adding color information from Sloan, the families are even better defined. When asteroids are discovered, they are initially named with numbers and letters encoding when they were first spotted. The Minor Planet Center at the Smithsonian Astrophysical Observatory gives them these alphanumeric codes. When an asteroid is first discovered, it is given a provisional designation like “1999 RQ36.” The first four digits tell you what year it was discovered. The last four characters tell you when in that year it was discovered. For example, 1999 RQ36 was the 916th object observed in the first half of September, 1999. Once the asteroid’s orbit is precisely known, it is issued an official sequential number. 1999 RQ36 was the 101,955th asteroid to receive a number, so it is now formally known as 101955. Only about 5% of numbered asteroids have been given names. The asteroid’s discoverer can propose to the International Astronomical Union (IAU) to give the asteroid a formal name. The IAU has established rules to guide the selection of names for objects located in different parts of the solar system. After approval, an asteroid is referred to by both its name and catalog number, such as 11365 NASA, 9252 Goddard or 8749 Beatles. As many of you know, we joined forces with the Planetary Society to find a new name for asteroid 1999 RQ36 – Bennu! The scientists and engineers that work on OSIRIS-REx attract plenty of professional honors. However, we wanted to find a unique way to recognize exceptional personnel. 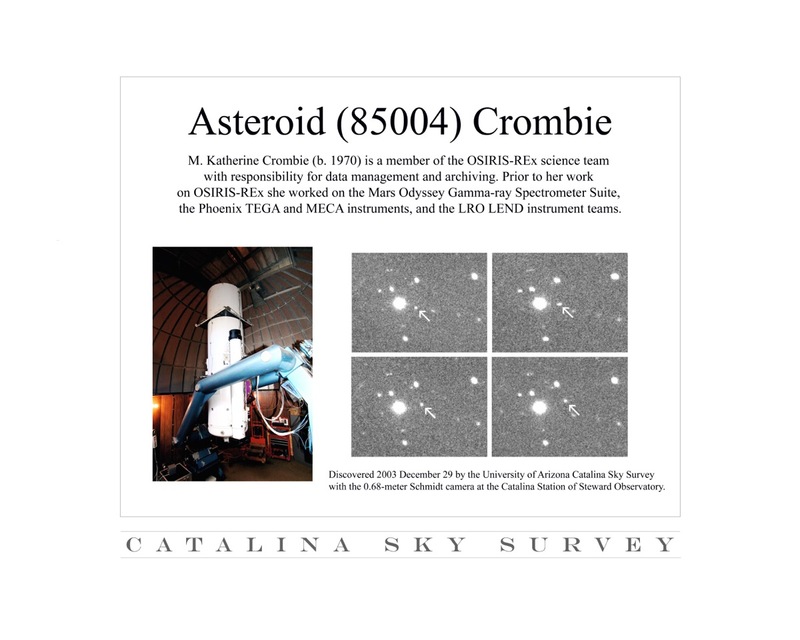 Fortunately, the Deputy PI of OSIRIS-REx, Ed Beshore, used to lead the Catalina Sky Survey, which has discovered thousands of asteroids. Together we decided to recognize our colleagues by naming an asteroid after them! Members of OSIRIS-REx are recognized for their contributions by having an asteroid named after them. Are the Osirians a new asteroid family? – not according to the scientific definition. However, the Osirians are a family in the more traditional sense of the word. We are a group of people that are dedicated to working together, helping each other, and focusing our efforts to bring back a sample of Bennu. It is also a family that is growing, with many more worthy individuals being added to the list on a regular basis. Analysis of the orbital elements of the Osirian asteroids (red dots) reveal an asteroid “family” that is distributed across the main belt.